WordPress packages two plugins with the installation files: Akismet and Hello Dolly. Akismet is an essential plugin. Hello Dolly isn’t necessary to make your blog run smoothly, but it adds some extra fun. Akismet is the mother of all plugins and that no WordPress blog is complete without a fully activated version. Apparently WordPress agrees, because the plugin has been packaged in every WordPress software release since version 2.0. Akismet was created by the folks at Automattic — the same folks who bring you the Sidebar Widgets plugin. Akismet is the answer to comment and trackback spam..
On the Plugins page, click the Activate link under the Akismet plugin name. A yellow box appears at the top of the page, saying: Akismet is almost ready. You must enter your Akismet API key for it to work. An API key is a string of numbers and letters that function like a unique password given to you by WordPress.com; it’s the key that allows your WordPress.org application to communicate with your WordPress.com account. Click the link in the yellow box to obtain your WordPress.com API key. Clicking this link takes you to the Akismet Configuration page on your WordPress Dashboard, where you enter your API key in the Akismet API Key text field and then click the Update Options button to save your changes. You can stop here if you already have a key, but if you do not have an Akismet key, keep following these steps. Click the Akismet.com link on the Akismet Configuration page. This opens the Akismet website in your browser window. Click the Get an Akismet API Key button. Enterprise: $50/month for people who own multiple WordPress-powered websites and want to use Akismet on all of them. Pro: $5/month for people who own one small, nonpersonal (or business) WordPress-powered site. Personal: $0–$120/year for people who own one small, personal, WordPress-powered blog. You can choose to pay nothing ($0), or if you’d like to contribute a little cash toward the cause of combating spam, you can opt to spend up to $120 per year for your Akismet key subscription. Select and pay for (if needed) your Akismet key. After you’ve gone through the signup process, Akismet provides you with an API key. Copy that key by selecting it with your mouse pointer, right-clicking, and choosing Copy. 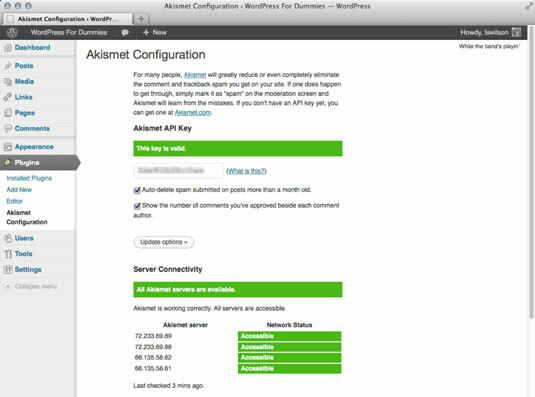 When you have your API key, go to the Akismet Configuration page by clicking the Akismet Configuration link in the Plugins menu on your WordPress Dashboard. Enter the API key in the Akismet API Key text box and click the Update Options button to fully activate the Akismet plugin. Auto-delete Spam Submitted on Posts More Than a Month Old: Enable this option by selecting the check box next to it to tell Akismet to automatically delete spam comments on posts that are more than a month old. Show The Number of Comments You’ve Approved Beside Each Comment Author: Enable this option by selecting the check box next to it to tell Akismet to display the number of approved comments each comment author on your blog has. Akismet catches spam and throws it into a queue, holding the spam for 15 days and then deleting it from your database. It’s probably worth your while to check the Akismet Spam page once a week to make sure that the plugin hasn’t captured any legitimate comments or trackbacks. The Comments page appears, displaying a list of the most recent comments on your blog. The Comments page now displays all spam comments that the plugin caught. Browse through the list of spam comments, looking for any legitimate comments or trackbacks. If you locate one that’s legitimate, select the Approve link directly below the entry. The comment is marked as legitimate. In other words, you don’t consider this comment to be spam. The comment is then approved and published on your blog. This is not just a plugin, it symbolizes the hope and enthusiasm of an entire generation summed up in two words sung most famously by Louis Armstrong: “Hello, Dolly.” When activated, you will randomly see a lyric from “Hello, Dolly” in the upper right of your admin screen on every page. 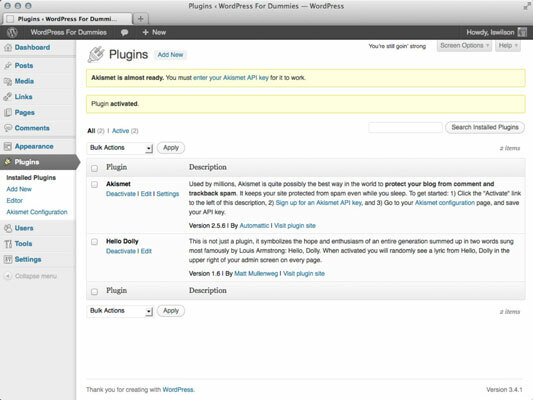 Activate the Hello Dolly plugin on the Plugins page on your WordPress Dashboard. When you’ve activated it, your WordPress blog greets you with a different lyric from the song “Hello, Dolly!” each time. If you want to change the lyrics in this plugin, you can edit them by clicking the Edit link to the right of the Hello Dolly plugin on the Plugins page. The Plugin Editor opens and lets you edit the file in a text editor. Make sure that each line of the lyric has its own line in the plugin file. This plugin may not seem very useful to you and, in fact, it may not be useful to the majority of WordPress users, but the real purpose behind the plugin is to provide WordPress plugin developers with a simple example of how to write a plugin.